Japan’s Sport Council has had a turbulent few years deciding on a design for its Olympics stadium, but it’s finally chosen one. This sympathetic structure will be the focal point of the 2020 Summer Olympics. Just last week, the country’s Sport Council released two new proposals for the stadium, which were designed to be smaller and more sensitive to the surroundings than the original Zaha Hadid design. 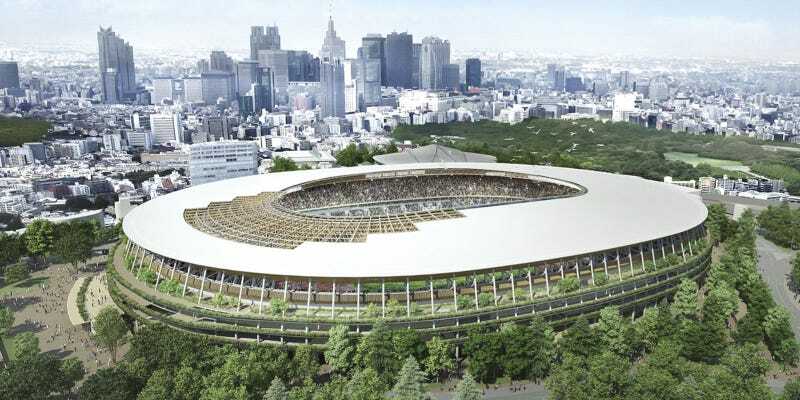 The new stadium, pictured above and created by Japanese architect Kengo Kuma, will cost around 149bn yen—that’s $1.2bn. The price tag is substantially less than the Zaha Hadid design, which would have cost more like $2 billion. The whole debacle has proven to be somewhat of a procedural departure compared to conventional stadium design processes, which may end up having a profound impact on the way cities build the temples to sport.